Welcome to the inaugural edition of the Hanford Vit Plant’s new periodic e-newsletter, Vit Bits. With so much activity going on at the Vit Plant, I want to make sure we’re providing you - our stakeholders - regular communication about the project and its progress. I’m proud of the work that our nearly 3,000 employees are doing to ensure we can safely treat the 56 million gallons of nuclear waste in the tanks at Hanford. In each issue, you’ll find the latest bits on how we’re focused on completing the mission, interesting statistics, volunteer efforts and community support, Bechtel’s role in the Tri-Cities community, and how we’re striving for transparency and accuracy while working with the dozens of auditors who visit the Vit Plant each year to review and assess the project. I encourage you to let us know what you think of our first issue and the contents – and share any suggestions for how we can better communicate with you. Send an email to hanfordvitplant@gmail.com. In February, a team of about 30 auditors from the Department of Energy’s Office of River Protection will examine the effectiveness of changes we've worked hard to make in the Vit Plant’s Quality Assurance Program and Corrective Action Management Program. In 2013, an ORP audit and the Project’s own internal examination found that the programs were not fully effective. In response, the Project developed the Managed Improvement Plan and committed to completing specific corrective actions. The senior management team shepherded these changes to institutionalize the Project’s quality culture and reinforce the importance of “bulletproof” quality. A second group of auditors this spring will conduct what is called a “vertical” review in which they dive into the engineering, nuclear safety and procurement processes in one area of Plant operations. Review of WTP’s Engineering Processes. Conducted by DOE’s Office of Enterprise Assessments, it evaluated engineering process improvements and deemed them “fundamentally sound” while providing input on areas for continued improvement. Review of WTP’s Construction Quality. Part of an ongoing quarterly review of construction quality, the December 2015 report indicated performance is “satisfactory” while identifying areas of improvement. 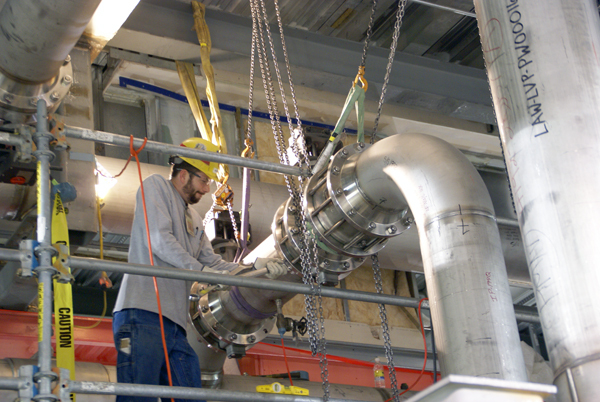 A pipefitter uses a wrench to tighten bolts on ventilation piping at the Low-Activity Waste Vitrification Facility. Many construction managers measure project progress by the percentage of pipe received and installed. 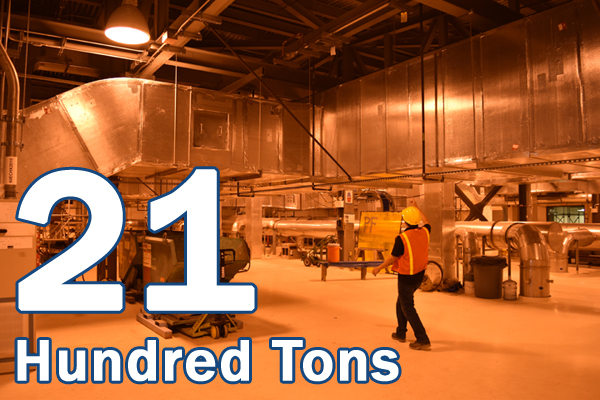 By that measure, the Low-Activity Waste Vitrification Facility has hit a major milestone. “We received the last of the bulk piping for LAW. We stand at about 96 percent installed today,” said John Andreatta, area superintendent for LAW. That amounts to more than 110,000 feet of pipe installed, or nearly 21 miles. The first pipe for LAW was received in October 2003. It ranges from one-half inch to 24 inches in diameter. Most of the pipe was fabricated offsite and shipped to WTP for installation. The total amount of piping to be installed is 115,000 feet, and installation should be completed in 2017. For more information, visit http://bit.ly/1VQk6Ze. 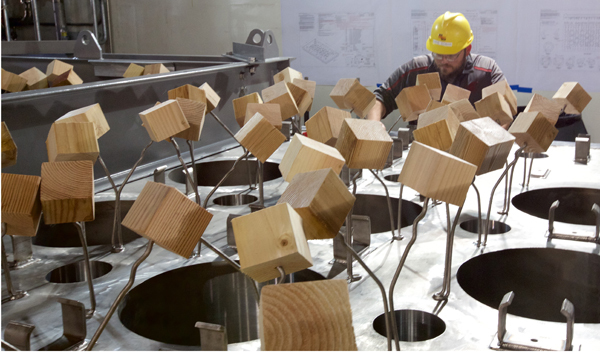 Vit Plant workers place wooden 4x4-inch blocks over steel rods as protection while they finish work on the glass-melter lids. Workers continued placing a cement-like material, called castable refractory, in the lid of one of the two radioactive waste glass melters for the Low-Activity Waste Vitrification Facility. Once operational, liquid radioactive waste will be mixed with glass-forming materials in the two melters at the LAW Facility and heated to 2,100 degrees F. The molten material will be placed in containers to cool and then transported for permanent on-site disposal. The lid refractory is used to insulate the melters. The melter lids are inverted and refractory is placed in sections. Once completed, the lids will be flipped and installed on the melters. At 300 tons each, when completed, the LAW melters will be the largest waste glass melters in the world. They are nearly five times larger than the 65-ton melter in operation at the Department of Energy Savannah River Site's Defense Waste Processing Facility in South Carolina. For more information, visit http://bit.ly/1Nv0E2n. The Hanford Vit Plant construction site. In 2015, the Hanford Vit Plant awarded more than $111 million in subcontracts to businesses based in Washington and Oregon and, of that, nearly $90 million to those in the Tri-Cities. These subcontracts represent 68.7 percent and 55 percent respectively of all those awarded for construction of the Vit Plant – and represents the largest percentage awarded in the past five years to Tri-Cities and regional businesses. The figures represent spending in Fiscal Year 2015. 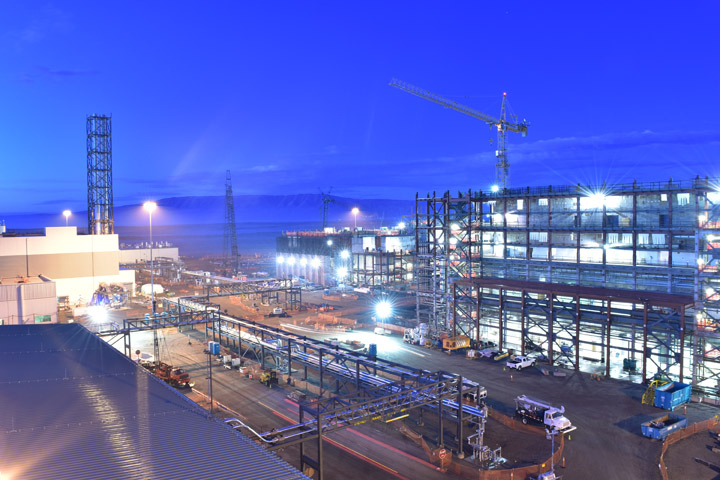 Since Bechtel began construction of the Vit Plant, it has purchased more than $1.7 billion in goods and services from Washington and Oregon businesses with $1.2 billion of that from Tri-Cities businesses. For additional information, visit http://bit.ly/1V8MGVk. 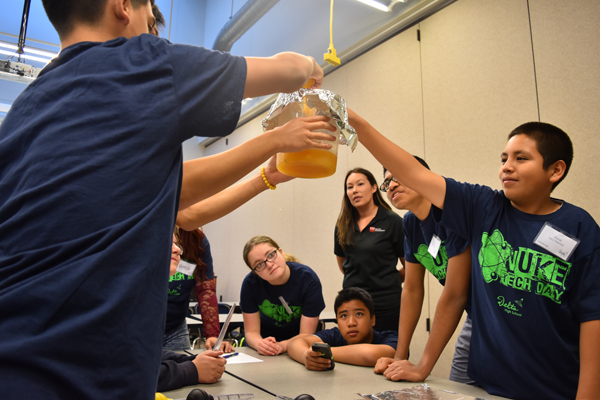 Bechtel volunteers from the Hanford Vit Plant used pulse jet mixer technology to promote careers in science, technology, engineering and math fields to Delta High School freshmen as part of STEM Nuclear Technology Day at Columbia Basin College. Click the thumbnail for video from the event. Peggy McCullough, Bechtel's Project Director at the ‪Hanford‬ Vit Plant, spoke at the Women in STEM Town Hall event at Washington State University Tri-Cities in November. 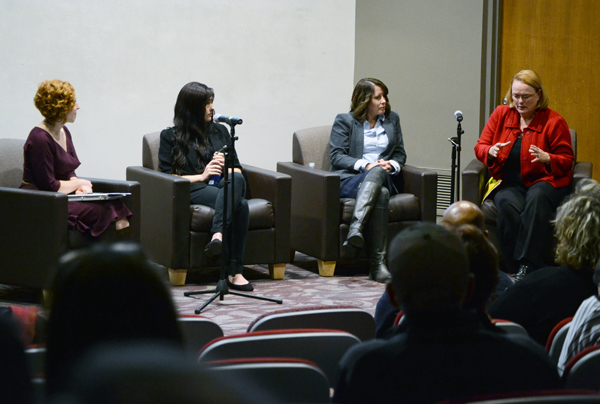 McCullough was part of a panel of experts who discussed women's issues in science, technology, engineering and math careers. A global leader in the engineering and construction industry, ‪Bechtel‬ is committed to helping develop the next generation of ‪STEM‬ professionals. Bechtel National Inc. and its employees at the Hanford Vit Plant donated more than $590,000 to community organizations in 2015. 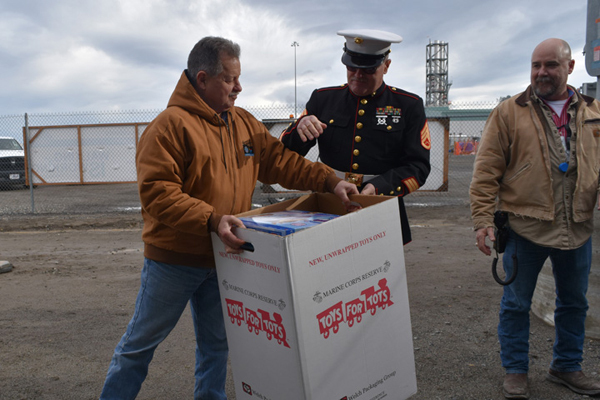 Most recently, Vit Plant employees donated thousands of toys and more than $35,000 to the U.S. Marine Corps Reserve’s Toys for Tots campaign. Additional recipients included the United Way of Benton and Franklin Counties, Second Harvest, Junior Achievement, March of Dimes and others. For more information, visit http://bit.ly/1n9REFI. The Vit Plant requires 2,100 tons of ductwork and contains ducts that measure up to five feet in diameter. The ductwork provides heating and cooling to the plant's facilities, as well as the path for treated exhaust to be discharged via stacks during operations. The Vit Plant is one of the most scrutinized projects in the world. Its design, construction and, ultimately, operation are the result of input from experts around the world from national laboratories, universities, review teams and more. At any one time, the Vit Plant has as many as 40 reviews, both internal and external, going on. Fog rolls over the main facilities at the Hanford Vit Plant. Clockwise from the top are the High-Level Waste Vitrification Facility, the Pretreatment Facility, the Analytical Laboratory and the Low-Activity Waste Vitrification Facility. and download on Flickr at https://www.flickr.com/hanfordvitplant/. Copyright © January 2016 Bechtel National, Inc., All rights reserved.